The Day of the girl is a worldwide response to an urgent problem facing girls around the globe in the neglect and devaluation of girls. In the month of October each year, we work to highlight, celebrate and promote the betterment and fulfillment of young girls across the globe. When young girls come together, they can discuss what really matters to girls. They can teach themselves, adults, boys, and other girl’s new ways of thinking about gender issues, which will empower young women to take action and to change the status quo. Our goal is to keep hosting this event at no cost to the girls that attend or their families. We would love to have you, your group or organization participate, donate, or perform! The day will be filled with educational activities but will also with creativity and fun! -Business Basics- Build your own empire! This event is created by local teen girls for local teen girls and is brought to you by The Zandra TLC Foundation. As the 13-year-old CEO of Azariah’s Innocence, LLC, Zandra A. Cunningham received the Day of The Girl Buffalo Proclamation from Mayor Byron Brown in 2013. Since that day we have been able to host a full day summit at no cost to the girls or their families for the last 4 years. 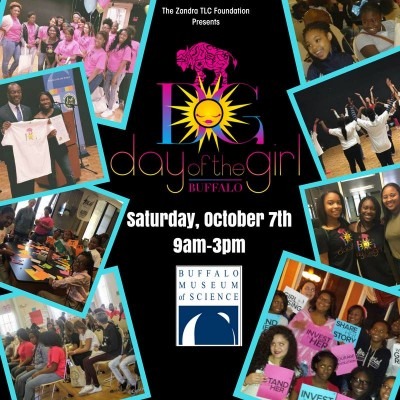 Established in 2016, The Zandra TLC Foundation is a 501(c)3 that was created to expose, empower, and inspire Girls ages 7 -18 with an emphasis on underserved communities to see beyond their current situations and expose them to new possibilities in career choice, health, wellness, STEAM and more. We know that girls have the power to change their families, communities and impact the world. The Zandra TLC Foundation promotes quality programming that helps create social and economic change through education and entrepreneurship.